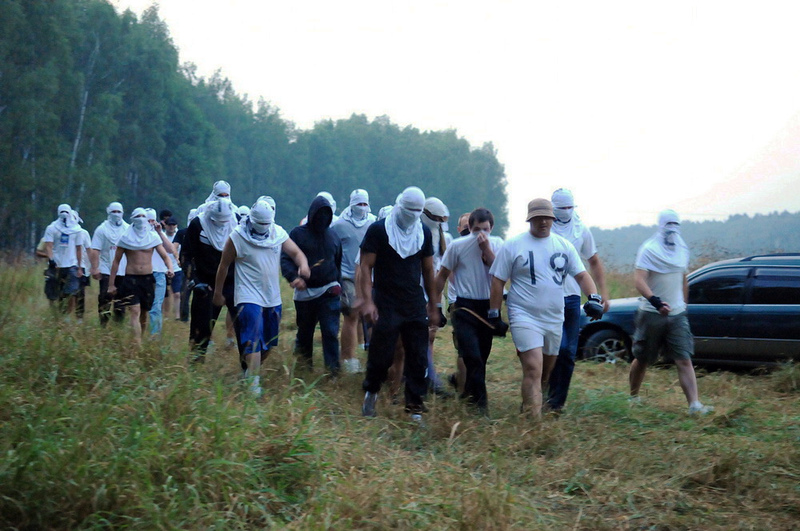 Men on their way to beat up people protecting the Khimki forest, some with right wing extremism symbols on their clothes. More than hundreds activists have gathered at Eda climate camp North of Stockholm 2-8 of August organized by Friends of the Earth Sweden and educational organizations. Here we were reached by the news from Moscow. Right wing extremists have been used to attack environmental activists protecting the Khimki forest and protesting against a high way project. The police who came late to the site reacted by arresting the environmental actvists. Two environmental and anti-fascist protesters are now also facing severe charges for continued protests. Thus we issued a solidarity statement see, below. There are many ways to make international protests both against the repression and against the European investment Bank and EBRD who are possible funders of the toll high way project. See links below. Transportation and urban planning is at the core of the climate issue. Emissions from ever increasing road transport is frequently addressed as the main problem for solving climate change in industrialized countries and targets set for diminishing the climate effects of transportation is as frequently among the biggest failures in climate politics. The present development model built on increasing social injustice domestically and internationally needs ever increasing transportation and urban planning segregating people to maintain its dominance and continue exploiting nature and human beings. Thus it is no coincidence that some of the severe environmental conflicts concerns road traffic and urban planning. Furthermore we see a growing convergence of different movements in a time of stronger repression. This calls for solidarity between different movements and internationally. The growing repression we face have resulted in a volatile situation for protesters and big fluctuations in the ability to mobilize. Popular movements needs not only mass support in their own countries but also that simultaneous struggles goes on in other countries as well as at times international solidarity. This has been especially hard in Central and Eastern Europe where people in common have lost much of their faith in collective protests. Movements work under extreme conditions with lack of visible popular support confronted by severe repression and violence from civilian supporters of a strong national state or corporations. Thus one activist was killed in an environmental camp against a uranium processing plant in Siberia by right wing extremists attacking the small camp beating most of the people in the camp in 2007. The authorities responded by accusing the camp organizers for provoking the attack. The situation in Moscow is similar. Very few dare to take up a fight and when they do so they get easily beaten or murdered. At the European Social Forum 2010 Rule of Law Institute from Russia organized a seminar on right wing extremism in Russia showing how more than a hundred persons get killed each year due to the right wing violence. When the former leader of the Rule of Law institute, the social democratic lawyer Stanislaw Markelov who often defended antifascist anarchists came out from a press conference on the crimes made by Russian military in Chechnya he was together with Anastasia Baburova gunned down on the footsteps of the building in the middle of Moscow. One year later a mass manifestation in their memory of the two murdered activists was organized on January 19. It was the biggest demonstration in Moscow for four years with one thousand people attending from many different strands in the movements in Russia with the police harassing the demonstrators and anarchist antifascist as a strong component. In many political struggles in Russia as the environmental or violence against migrants or people from the periphery of the Russian federation antifascists are the main organizers of solidarity and the strand of the movement that do not give up neither in front of right wing extremism or repression. This is of utmost importance in times of lack of visible mass support. The unifying event on January 19 made it possible to gain strength and renew efforts to confront strong economic interest as in the case of the Khimki Forest. Earlier the exploiters closely linked to the local Khimki government had succeeded in stifling the movement by violent attacks on one of its voices, the journalist Mikhail Beketov. The attempted murder in 2008 did not succeed and there are no official results of the investigation but many Khimki residents believe that the local authorities were involved in the attack. A strong force behind the exploitation is the Transport Ministry and the “non-commercial organisation”, Avtodor which combines the functions of a government agency and a business. The project is planned as the first large-scale public-private partnership with the involvement of western investors – the EBRD and European Investment Bank. The intermediary link will be the North-West Investment Company, backed by the French firms Vinci and Eurovia, who have extensive experience of attracting European investments. But the environmental laws were in the way. Protesters tried to stop the illegal cutting of the forest for the road project but were confronted by a combination of forces. One was the police who helped the illegal exploiters in spite of a court ruling in favor of the protesters. Another was the general lack of trust in protesting collectively in Russia which makes the number of protesters small in spite of a very broad support ranging from liberal party leaders, the alternative globalization movement going to European Social Forums, a famous rock stars to Anarchist and traditional environmentalists and local citizens previously not engaged in conflicts. Finally when the protests continued right wing extremist were called in to beat up the protesters followed by the police arresting the protectors of the environment. In response to the repression of the movement some 90 or 300 activists anonymously attacked the municipal headquarter smearing it with stones and graffiti. None was arrested at the occasion but afterwards Maxim Solopov and Alexei Gaskarov got arrested. As both are publically known spokespersons for the Anti-fascists they are easy to find for the police who needed result in their reaction to the direct action against the symbols of power in Khimki. There is serious questioning against the claims made by the police as there are no proofs of their presence and that it is hard to see a reason the very few persons known by the public and the police should have participated in the action. In the general “anti-extremism” change of laws the action against the municipal building is claimed to be very serious and can result in 7 years of imprisonment. The following violent arrest of the leader Yevgenia Chirikov of the Khimki protest movement on August 4 shows clearly that the authorities are lying and playing a political theatre orchestrated by other interests than protecting law and order. She has been contacted by the police at several occasions and appeared at voluntarily police stations as a witness in the case of the murder of lawyer Stanislaw Markelov and the assault against the journalist Mikhail Beketov. Now she was arrested in speculative and brutal manner by the special police force OMON used against riots and terrorists directly after a press conference against the arrests of Maxim Solopov and Alexei Gaskarov . A spokesman for the Moscow Region Directorate of Internal Affairs (i.e., the police for the region around Moscow, not the city itself) later claimed that Chirikova was detained because she had failed to respond to a summons in connection with the investigation of the attack (allegedly by anarchists and antifascists) on the Khimki administration building. But Chirikova was never given a summons and thus not given the possibility to voluntarily come to the police station as the system chose to organize a political theatre instead based on false claims of the refusal of Chirikova to appear voluntarily. She commented afterwards that her arrest resembled a “demonstrative action” directed against environmentalists. Was it at stake is not only the Khimk forest and profit interest high up in the local and national government linked to abuse of the police to protect those interests. It is also the question of the legitimacy of the present development model in Russia which is much based on the same kind of close linkage between private exploitation interests and the government keeping people in common passive with the help of mass media and a combination of police and right wing extremist violence. As this authoritarian system lacks a belief in its capacity to get spontaneous support for their exploitation they see any kind of protest also when it only concerns a local matter as a threat to the whole system. This makes it utterly dangerous for those that are organizing protests. What is at stake is the future of the whole international/translocal climate justice and other system critical movements. We are not stronger than our weakest links. Furthermore the growing repression we see in Russia is also taking place everywhere. With authorities that are given ever increasing juridical means to stop any kind of protest as being caused by “extremism” leaving all traditional juridical ideas of individual responsibility and evidence behind. The Khimki protests against exploitation is a case were especially the accusations against Maxim Solopov and Alexei Gaskarov are crucial to challenge by combining environmentalist and social justice concerns in a joint struggle against repression. What is remarkable is that those promoting the toll high way through the Khimk forest refuses any compromise with the wide spread environmental opinion against the exploitation in spite of that they are in a politically fairly vulnerable position. 2/3 of the investments is planned to come from Western funding through EBRD and the European Investment Bank, both known to keep an eye on the environmental impact at least when the negative effects are too obvious and concentrated. They also do not like to be connected to projects that becomes too controversial including violent repression. In spite of this political vulnerability those in power have chosen to continue escalating the pressure against the protesters in an attempt to split the opposition hoping for creating an image of violent aggressive activists working against society and peaceful but harmless opinion makers. Thus the exploiters are challenging the whole European environmental opinion trying to establish a de facto acceptance of European Bank support of any environmentally destructive project regardless how easy a better alternative could be chosen which should save the forest but not the highest level of profit. If the exploiters win and are able to get the financial European support they need it would be a historical defeat for the European environmental opinion. The Russian opposition has chosen to show its strength by sticking together. The protest leader Chirikova who by all means can be described as a main stream environmentalist with modest and well informed arguments was among the speakers at the press conference to defend the arrested anti fascists Solopov and Gaskarov. It is hard to believe that the spectacular arrest by special riot and anti-terrorist police force of her directly after this press conference is anything else than an attempt to put a violence stamp on the whole environmental protest and create fear. But those in power failed to split the Russian movement. The 19 of January committee which is the result of the unification of forces during the comemoration of the murder of Markelov and Baburova calls for solidarity. It is now up to international movements to show that the provocation against the European environmental opinion in completely disregarding the local opinion against building of the toll high way through the Khimk forest and still believing in financial support from Europe is met by a strong no. It is even more up to the whole global environmental justice and all popular movements to show that the attempts at using right wing extremism combined with repression against a movement is not accepted in Moscow or anywhere else. The growing repression we have seen at the Climate summit in Copenhagen, against the landless movement MST in Brazil, against migrants and protesters of all kinds not only in impoverished countries but also the rich and industrialized must be confronted by common efforts. The authorities start to leave all earlier notions of freedom of expression and individual evidence for committing a crime behind. The heavy possible and necessary involvement of EU funding in the project through EBRD and the European Investment Bank makes it also possible to mobilize substantial protests against the project. We have to join hands across borders and movements to build solidarity. We are protesting against the arrests of environmental activists in connection with protests against highway construction around Moscow at Khimki forest. We look with concern on how both the right wing extremist violence and state repression is used against the protests. Everyone’s health and the right to a living nature for future generations are at stake in environmental conflicts. The authorities ignoring the right-wing violence and repression against the protests are unacceptable. Participants at the Climate camp in Eda organized by Friends of the Earth Sweden and educational organizations. Khimki: Police Repression as an Aid to Deforestation, On the arrests of Max, and Alexei. Freedom for Russian antifascists Alexei Gaskarov & Maxim Solopov! 483 members August 5. Khimki: Save The Forest! A newly started facebook group. 17 members August 5. Sign the online letter below and ask the European Investment Bank and the European bank for Reconstruction and Development to condemn publicly illegal acts of deforestation and violence against peaceful demonstrations. Greenpeace Russia: Help Defend the Khimki Forest! Thank you so much for your thoughtful article and your support. We hope your example proves to be infectious. The Khimki Forest defenders need all the help and publicity they can get at this point — especially, as you’ve pointed out, protest letters to the Russian authorities, as well as to the international lending institutions and foreign firms involved in the highway project. An irony that cannot be lost on Moscow’s 10 million people right now is that the city is literally choking from the smog caused by forest and peat bog fires in other parts of the Moscow region, but here the state and the police are bending over backwards (and breaking the law in the process) to cut down an old forest that provides clean air to the capital. ….. going strong. Kram kärlek och respekt. Må varje ord från dig vara epidemiskt …….